Re-releasing classic arcade games on consoles can be a perilous task. Consider 2011’s Mortal Kombat Arcade Kollection, a katastrophically inkompetent repackaging of the first three titles. Or the 2012 Kinect-enabled version of Dragon’s Lair, a port so cringe-worthy we compared it to David Lee Roth’s solo career. Yet even if arcade classics are expertly restored for their console reissues, there will inevitably be something missing. The living room, despite hardware makers’ pretensions to the contrary, is not an arcade. And even if it were, does every vintage game really hold up all these years later? Nostalgia is a hell of a drug. So it often seems the best one can hope for with this type of title is a mixed bag. The result is better for Capcom’sDungeons & Dragons: Chronicles of Mystara, which collects two classic D&D beat-’em-ups, 1993’s Tower of Doom and 1996’s Shadow Over Mystara. The games themselves are historical curiosities. 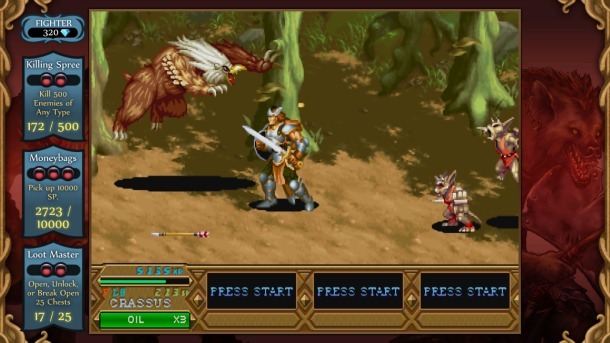 Both are side-scrolling, 2D adventures set in the D&D Mystara campaign, where up to four players cooperate to slay monsters and collect treasure. Yet what differentiates them from arcade peers like Teenage Mutant Ninja Turtles and Final Fight is the variety of mechanics their designers snuck into the beat-’em-up formula. Each hero has a series of special offensive and defensive moves, which can be combined in strategic ways. Magic-users can cast spells with a range of effects, from the straightforward Lightning Bolt to the more arcane Hold Person. You can equip class-appropriate weapons and items instead of merely consuming them—and they’ll break after too much use. Characters will level up between stages, presaging the modern action-RPG. Shadows Over Mystara features branching levels, allowing you to experience a slightly different path each time you play. Particularly in this genre, the old saying about variety and spice holds true: Both of these titles seem explicitly designed for repeated playthroughs. Although both games are short—I completed each within about an hour—they are colorful, varied, and certainly innovative for their time. Online multiplayer works smoothly, as does local co-op, and adventuring with a party is generally a lot more fun than going it alone. While Shadows Over Mystara is clearly the superior game, with more character classes, levels, items and secrets, Tower of Doom also has its charms. Yet a few nagging issues remain. Both games only make use of the four colored controller buttons, even though using the triggers to open sub-menus or perform moves like crouching would be much easier. The controller’s analog sticks are notoriously more finicky than an arcade joystick, leading to frustrating miscues. But a more difficult problem to account for in arcade reissues is the lack of quarters. When you have infinite continues, the tension of dying dissipates; there’s little incentive, beyond perhaps an Achievement, to hone your battle skills. Combat can too easily devolve into spamming the attack button. And the frequent boss battles, although well-tuned to the arcade, simply feel tedious on the console: Just hack away until the monster’s dead. The presentation and extras are well-executed, however. Developer Iron Galaxy has clearly poured a lot of love into their restoration efforts. 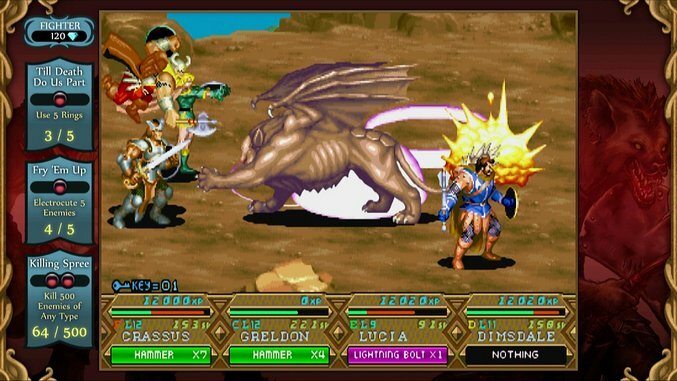 Like other arcade reissues, Chronicles of Mystara features a variety of visual settings, including the standard 4:3 windowed view and an odd virtual arcade cabinet perspective, which makes it seem like you’re watching over a friend’s shoulder in Chuck-E-Cheese. (Ironically, this option only drives home the fact that you’re not in an arcade.) In standard view, the side panes track your progress against game-specific Challenges, optional tasks like killing 50 monsters with thrown daggers. Completing Challenges earns you currency to unlock concept art as well as House Rules—cheats you can apply, like unbreakable items or using gold reserves as health, that further vary the game experience. Still, I’m left somewhat ambivalent about the Chronicles collection. It’s clearly a quality port of two noteworthy classics, games that deserve to be preserved and experienced for what they can teach about innovation within a genre. Yet it also feels a bit shallow for its $15 price tag, a bite-size experience that’s more curiosity than main course. I’m genuinely glad to have had the opportunity to experience these classics, which never made it to local arcades in my teenage years. But I don’t know how much I feel compelled to go back to them again and again. The Mystara games never quite made it past cult favorite status, and I’m not sure they deserve to. They may have been innovative, but they weren’t revolutionary. J.P. Grant is a Boston-based freelance writer whose work has appeared in Kill Screen, Gamers With Jobs, and other outlets. He blogs about games at Infinite Lag and is also on Twitter.